Got fresh peaches? 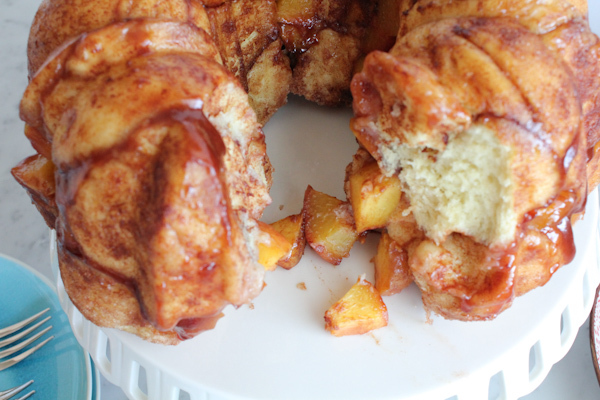 Try my Delicious Cinnamon Peach Monkey Bread!!! You’ve got to try this! Since joining Twelve Loaves and other baking groups, I must say. . my baking skills have improved. I love working with and kneading dough. I love how dough rises and doubles in size and you can create delicious, wonderful, magical things. And yeast ain’t got nothing on me. I used to be scared of yeast. It would take me 2-3 tries because I wasn’t sure I was activating the darn stuff the right way. Now? Yeast ain’t got nothing on me. Does this look like perfection or what? 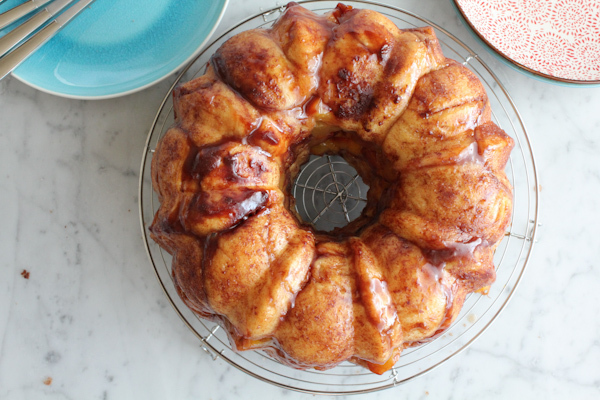 So, this was my first Monkey Bread. And let me tell you. Damn. I am sold. 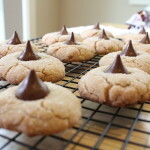 I’m baking these every week. 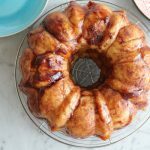 And ever since I laid eyes on Lora’s (The Cake Duchess and the wonderful person who started Twelve Loaves) GORGEOUS recipe for her Strawberry Monkey Bread, I knew I had to give her recipe a whirl. So, I did. The recipe below is LORA’S. I just used fresh peaches in place of the strawberries. Peaches and Cinnamon? What could be better? I hope you enjoy! 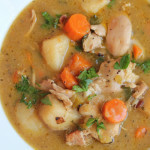 You really must give this recipe a try. . it’s so delicious! And I made my FIRST Instagram video cutting into this baby. Check it out. 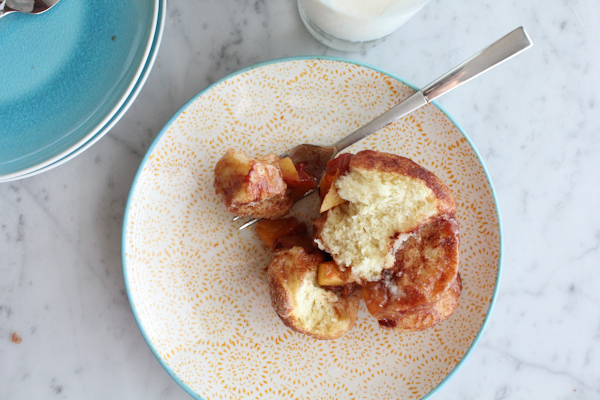 In case you have never baked a Monkey Bread, here are some step-by-step photos to help when filling up your bundt pan. 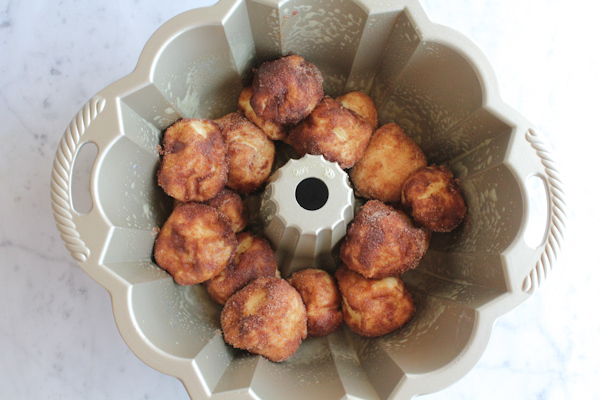 Spray your bundt pan generously with non-stick spray and place the coated dough balls (coated with butter, cinnamon and sugar. oh my!) into the pan to create a bottom layer. Next, drop in your peaches. Because you have small chunks, they will fall in between the dough balls and bake perfectly together. Top with more dough balls and then you’re ready to bake! 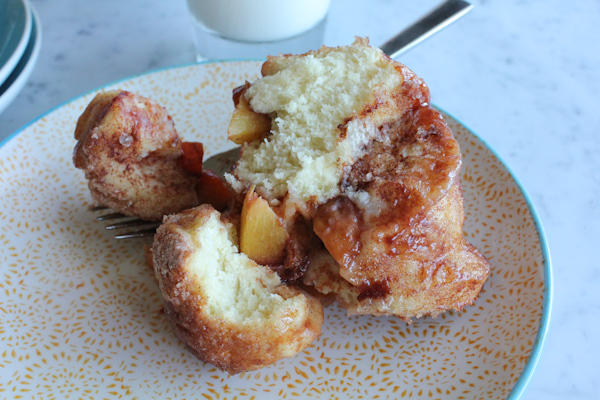 You can either cover all the peaches completely or leave a few peeking out. Believe it or not, this one is fresh out of the oven. But wait! 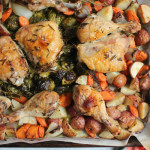 Allow the pan to cool for about 20-30 minutes and then invert onto a cooling rack or plate. Please note the rising time and plan accordingly. Heat the milk in a small saucepan over medium heat until little bubbles begin to form around the outer edge. Remove from the heat and let stand until cooled to room temperature. Meanwhile, sprinkle the active dry yeast into the warm water in the mixing bowl of your stand mixer. Let stand for 5 minutes. It should become bubbly and foamy. Add in the sugar, eggs and melted butter. Mix on low speed and then pour in the milk. Gradually mix in your flour and salt mixture on low speed, scraping down the sides of the bowl as needed, until everything is combined. 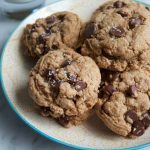 Turn your dough onto a lightly floured work surface and knead the dough for about 10 minutes, adding more flour if the dough is too sticky to work with. 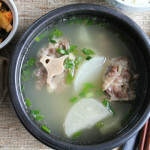 Grease a large bowl and place the dough into the bowl. Cover with plastic wrap and a kitchen towel (over the plastic wrap) and place in a warm spot until doubled in size, about 1 1/2 hours. When your dough is about ready, prep your ingredients for the dough balls. Melt the butter and mix the sugar and cinnamon in a medium to large sized bowl. Lastly, spray your bundt pan with non-stick baking spray and set aside. Preheat oven to 350 F.
Cut your peaches in half, twist to break apart and remove the pits. Slice into wedges and slice again to create small chunks. Place your peaches into a bowl and mix with the sugar and add a dash of cinnamon. Mix and set aside. Punch down dough when it is ready. Transfer the dough to a lightly floured work surface and portion it out into 1/2” size balls. (I used a bench scraper to cut mine). Dip each dough ball into the butter and then into the cinnamon sugar and arrange, forming a bottom layer in your bundt pan. Pour in your peaches and allow the peaches to fall as they may. They will fall in between the dough balls. And cover the peaches with the remaining dough balls. (Repeat same process to create remaining dough balls). Place the bundt pan on a parchment lined baking sheet (just for protection) and bake for about 40-45 minutes or until golden brown. 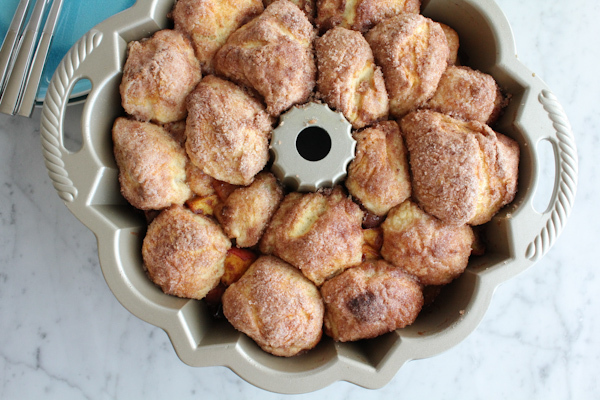 Start checking on your monkey bread after 30 minutes. Allow to cool for at least 20-30 minutes. Invert onto a cooling rack and plate and serve. 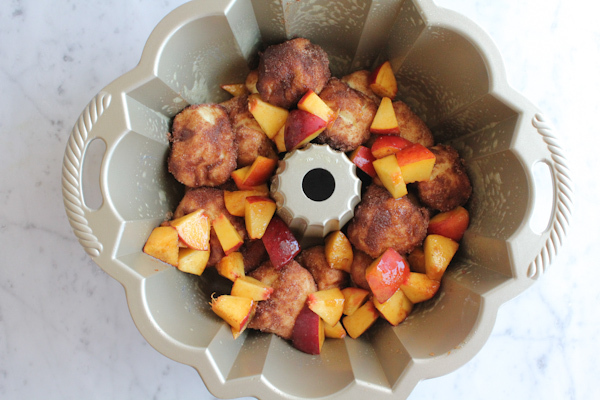 #TwelveLoaves July: We’re celebrating Stone Fruit! And this month, Twelve Loaves is hosted by the fabulous Paula from Vintage Kitchen Notes and awesome Renee from Magnolia Days. Summer is when we get to enjoy an abundance of fresh stone fruits at our markets so check out all of the wonderful recipes down below! Let’s create some breads with their juicy deliciousness! Share your favorite stone fruit bread recipe (yeast or quick bread). Let’s get baking! Want to join the #TwelveLoaves group? It’s easy! 3. Have your Twelve Loaves bread that you baked this July, 2013, and posted on your blog by July 31, 2013. 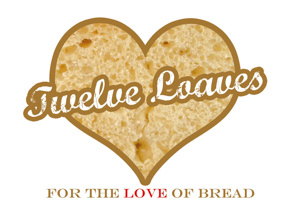 #TwelveLoaves is a monthly bread baking party created by Lora from Cake Duchess. 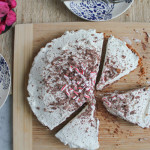 Chocolate Cream Pie with Lágrima Vanilla + A Giveaway! I made my first monkey bread some months ago, and had the same reaction. It´s a wonderful bread Alice, and full of fresh peach chunks! 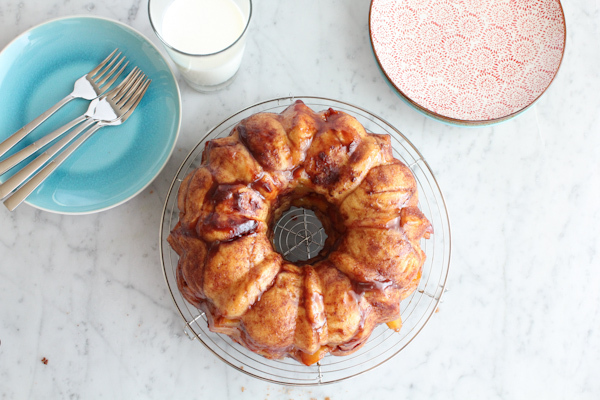 I would love to take a piece, and another, and another… yes, your monkey bread is dangerous! Thank you Paula. . yes yes. . I am eating some now with my coffee. . yum! Why yes, it does look like perfection and a perfect use of peaches too. Thank you, Krista! 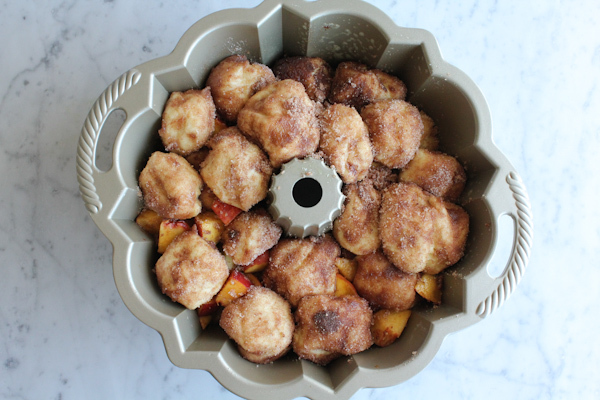 I also love peaches + cinnamon. . yum! Awh, thank you Lora! LOVED your recipe! 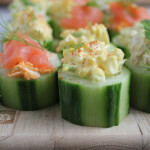 That looks downright decadent… in a healthy sort of way! Beautiful color and beautiful photos. I checked out the video too! Very nice. There’s so much gorgessity in this post, I can’t stand it! You’ve taken one of my favourite summer fruits and stuffed it into one of my favourite breads to bake. 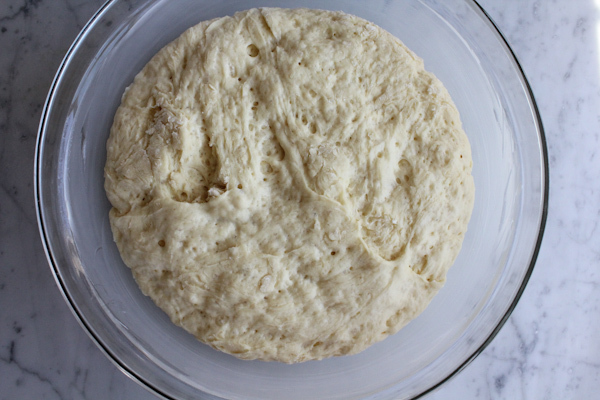 I’m so glad you’ve conquered yeast – like a total boss! Simply gorgeous! 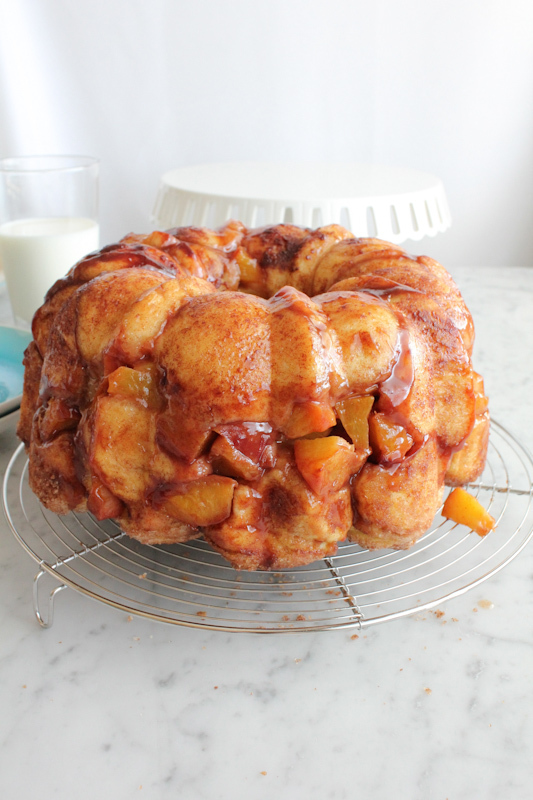 My mom always made monkey bread at Christmastime but I think your version with peaches is perfect for the summer. Such wonderful photos too! Awh, thank you Holly! 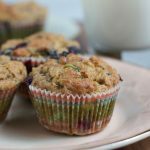 I loved your Peach Oat Quick Bread! I love anything peach, this is so me! I’ll have to get over my yeast anxiety…..
whoa baby, that looks good!! 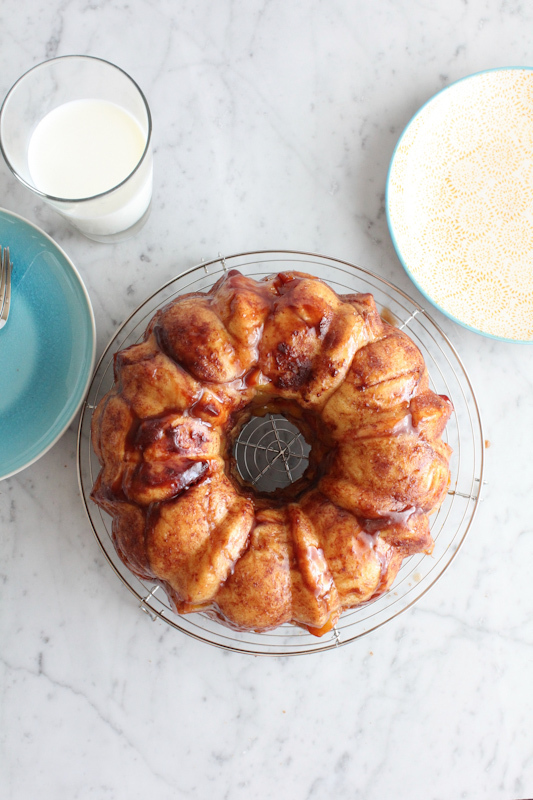 That is so what monkey bread should look like! The addition of peaches is so nice because this time of year everything’s better with peaches. Yes! I totally agree re: the peaches! Thank you, Laura! Great choice for this month’s theme. It looks so yummy! Hi Jessica, whole milk is best but reduced or 2% should be ok. Let me know if you make it! 🙂 Cheers!